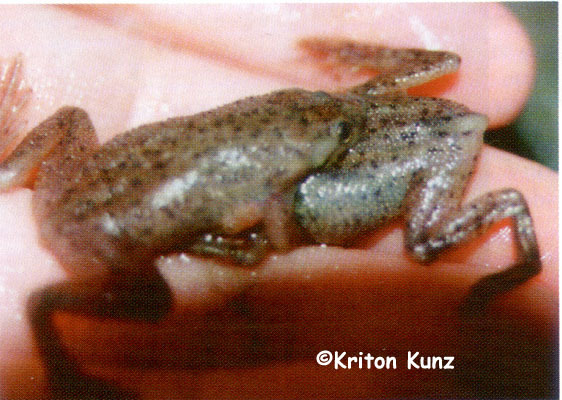 African Dwarf Clawed Frog or African Clawed Frog? 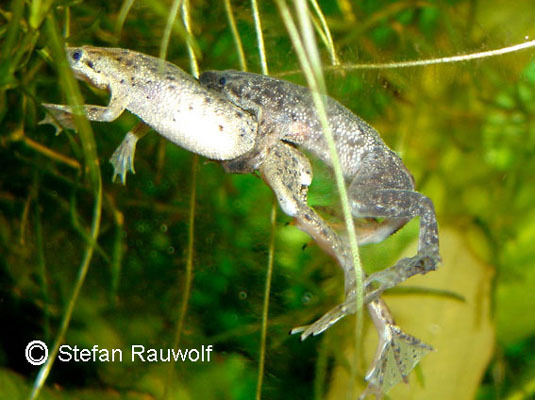 African Dwarf Clawed Frog males are definding small territories. 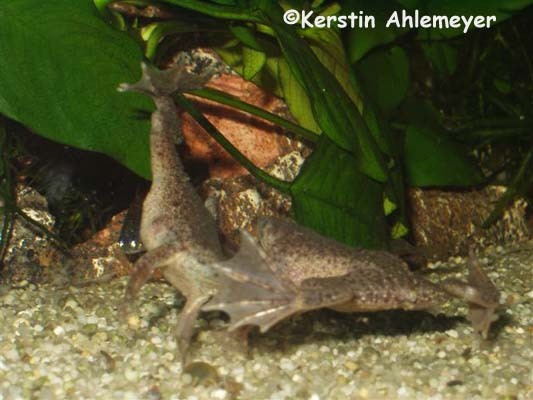 The are stretching their hind legs in line with the body and standing on their strechted front legs to show other males their territory. Although this is the calling position. In literature you can find advices to fights between males – called comment fights. By now I haven’t watched this on my frogs. 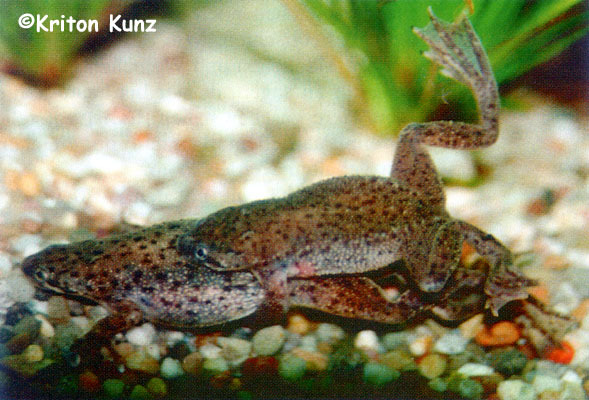 If the frogs are alone in a extra tank the males are callign very frequently. Females need a tank without fish to come in mating feelings. If you put both sexes in a extra tank sometimes it takes only a few days till the females are in mating feelings. 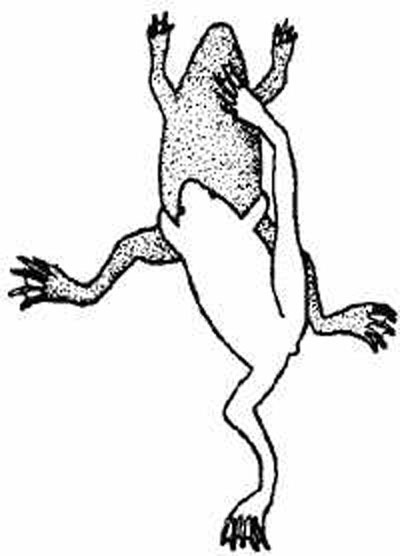 The males are grabbing the females in the lumbar region like this all primitive anurans are doing. The mating time is the night after 11 PM. Sometimes there are abnormal mating positions. There are homosexual positions, too. This is known from other anurans, too. More details on KUNZ 1999. Females which are not in mating feelings are shaking their body or moving through roots and plants to get out of the males amplexus. Although a defense call is known. Males are scratching fenals head with their hind legs to stimulate them. Then the female wants to lay eggs the so called mating dance is starting. The pair is swimming circles and on the water surface it turns over to swim on the back. Then the female lays some eggs (1<n<20). The figure of MÜLLER 1991 is not really realitic. VON FILEK 1985 figure is better. Bur for these round circles no plants have to be in the tank. On the next morning you have to put the parents or the eggs out in a extra tank. The parents will eat their eggs. After two days the tiny tadpoles ar hatching hanging around the whole tank like little commatas.